Size: 8 1/2 " x 11 " - Add this monthly paper cover desk planner to your marketing campaign to extend your brand's reach! It features a white, 10 pt. 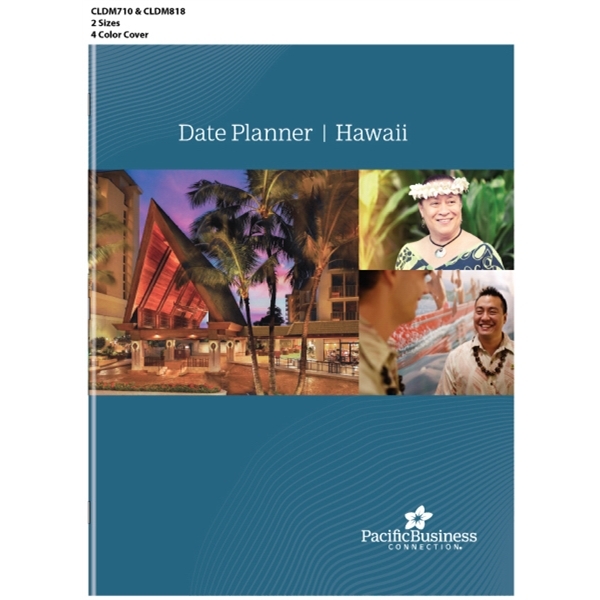 cover that's coated on one side and customized with your four color process imprint, square corners and a 14-month planning calendar (December of the previous year through January of the following year) with 32 pages. The inside stock is 60-lb white offset that's printed in blue and black or rust and black. Additional pages found in the back are future planning, phone number listing, time zone and area code map and a three-year reference calendar. Size: 8 1/2 " x 11 "
Price Includes:digital four color process. Imprint Size:6.5" x 9.5", 8" x 10.5"
Vital information should be kept within the imprint area. Image can bleed. The wrap is a section of custom pages between the cover and our standard calendar pages. 4 pages at 500 minimum printed. One to 4 colors at one price. Higher quantities (over 2500) call for a quote. Choice of stock print color. Standard inside - white. Academic year, August to September. Academic year August to September is available.